June 19, 2015– Lilongwe, Malawi- Today, the first students graduated from an innovative Pharmacy Assistant Training Program in Malawi, the result of a collaboration between the Malawi Ministry of Health, the U.S. Government through the USAID | Deliver Project, the Malawi College of Health Sciences, University of Washington Global Medicines Program, and Seattle-based NGO VillageReach. 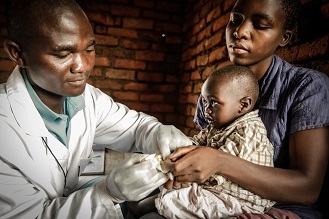 The program produces a dedicated cadre of individuals with enhanced training in medicines management and supply chain practices to eventually support each of Malawi’s 650 rural health centers. “The Pharmacy Assistants will go a long way to improve the quality of health service delivery in rural areas, as well as strengthening health systems in the country through improved medicines information management that the government can rely on and use to serve people better,” says Albert Khuwi, Health Technical Support Services Deputy Director for the Malawi Ministry of Health. 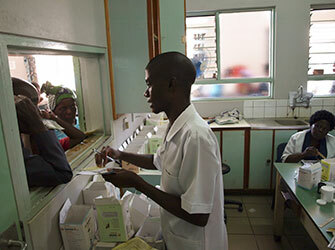 In Malawi, as in most low- and middle income countries, there is no dedicated pharmacy personnel at the health center level, leading to unsafe dispensing practices and inefficient supply chain management. Through this new program, students are not only trained to dispense life-saving medications and provide patients with essential advice, but they also gain the skills to effectively manage inventory to ensure a well-functioning supply chain. “This visionary program addresses one of the most critical issues facing many countries—shortages of qualified pharmacy workers. On behalf of my colleagues at the University of Washington, I congratulate the graduates,” commented Andy Stergachis, Professor and Associate Dean of the UW School of Pharmacy. The program launched in 2011 with funding support from the Barr Foundation, the USAID | DELIVER PROJECT, and Vitol Foundation. The current program will graduate two more cohorts, placing an additional 148 Pharmacy Assistants at rural health centers by 2017. The Malawi Ministry of Health has expressed the desire to place as many as 650 Pharmacy Assistants to meet the needs of its rural communities. 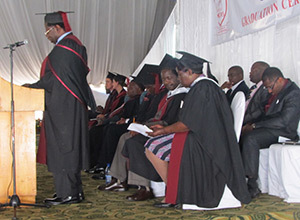 “The U.S. Government is proud of this successful partnership with the Government of Malawi, VillageReach, The Malawi College of Health Sciences, and the University of Washington, and very proud of the 20 USAID-sponsored students who graduated today. We are confident that these new Pharmacy Assistants will contribute greatly to the improvement of Malawi’s health sector,” noted USAID/Malawi’s Deputy Health Office Director Lilly Banda. 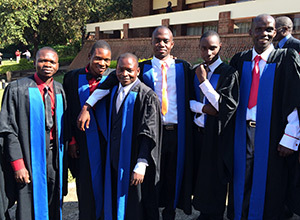 After graduation, the students will become employees of the Malawi Ministry of Health, which will place them for work in rural health centers throughout the country. About Malawi College of Health Sciences Malawi College of Health Sciences provides education and training of the highest quality to a range of middle level health personnel essential to promote health and improve services through provision of quality training, consultancies and research. About the University of Washington, School of Pharmacy, and Global Medicines Program Founded in 1861, the UW ranks 3rd in the world for Clinical Medicine and Pharmacy in the 2014 Academic Ranking of World Universities. The University leads the nation’s public research universities in receipt of federal support for research and training. The UW School of Pharmacy is committed to educating the next generation of leaders in pharmacy, pharmaceutical research, and health care—while seeking to ensure the safe, rational, and cost-effective use of medicines. The Global Medicines Program in the Department of Global Health works to improve the use, safety, quality, cost-effectiveness, and affordability of medicines in low- and middle-income countries through research, education, training and outreach. Visit http://globalmedicines.org, http://sop.washington.edu, and www.washington.edu for more information. 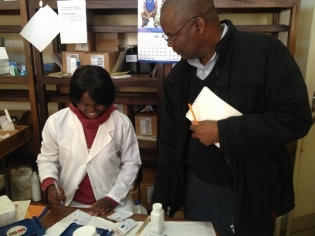 Pharmacy Assistant student attending to patients during practicum training in rural pharmacies. Blog: "This program is a big relief for rural health workers like me"